No, there are no termination fees. Can I use my regular bank? All major banks and many smaller ones support merchant accounts. It shouldn’t be a problem. 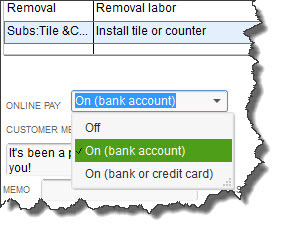 Do I need a special version of QuickBooks to set up payments? No. The tools you’ll need are built in. How will my customers know that I’m beginning to accept credit cards? They’ll follow the Pay Now link that comes with their invoice. This will take them to a secure site where they can enter their credit card numbers. If you’d like, you can send them an email ahead of time notifying them of the new service. Do I have to have a card reader/swiper to accept credit cards? No. You can purchase one and use it, which will reduce your service fees. But it’s not required. QuickBooks Payments will accept all major credit cards: Visa, Mastercard, Discover, and American Express. Your subscription also supports bank transfers. What if I want all large payments to be made by bank transfer only? 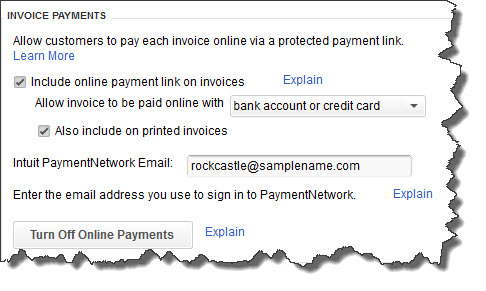 You’ll have control over how each invoice is paid, which you can specify on the invoice. Do I still have to enter these electronic payments into QuickBooks? No. Your company file will be auto-updated with the payment information. How soon do I have access to the money? Funds are usually available within 2-3 days. Can I accept payments on my mobile device? Yes, using an Intuit app called GoPayment. What does it cost to be able to accept credit/debit cards and bank transfers?